Ground controllers overnight remotely guided the Canadarm2, with its Dextre robotic hand attached, to deftly remove the CATS experiment from the SpaceX Dragon trunk. 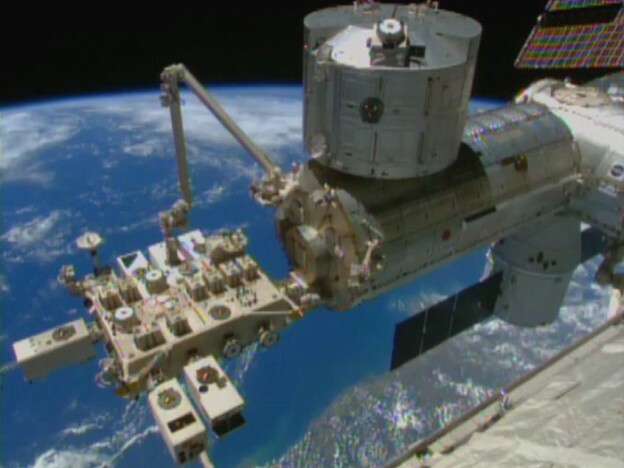 They then handed it off to the Japanese robotic arm for installation on the Kibo laboratory’s external platform. CATS, or Cloud-Aerosol Transport System, will collect data on the pollution, dust, smoke, aerosols and other particulates in Earth’s atmosphere to understand their impacts on global climate and create a better model of the climate feedback process. Back inside the International Space Station, the Expedition 42 crew worked on an array of new and ongoing science and continued unpacking Dragon. There were eye exams as well as research into the effects of long stays in space on the human T-cells, which are a critical part of our immune system. The crew also looked at how certain materials behave in space for the Coarsening in Solid Liquid Mixtures-2 (CSLM-2) experiment, which offers potential benefits for consumer and industrial products. In addition, they checked on the station’s fruit flies, which are also monitored by scientists studying their immune system as a model for a crew member susceptibility to disease in space. 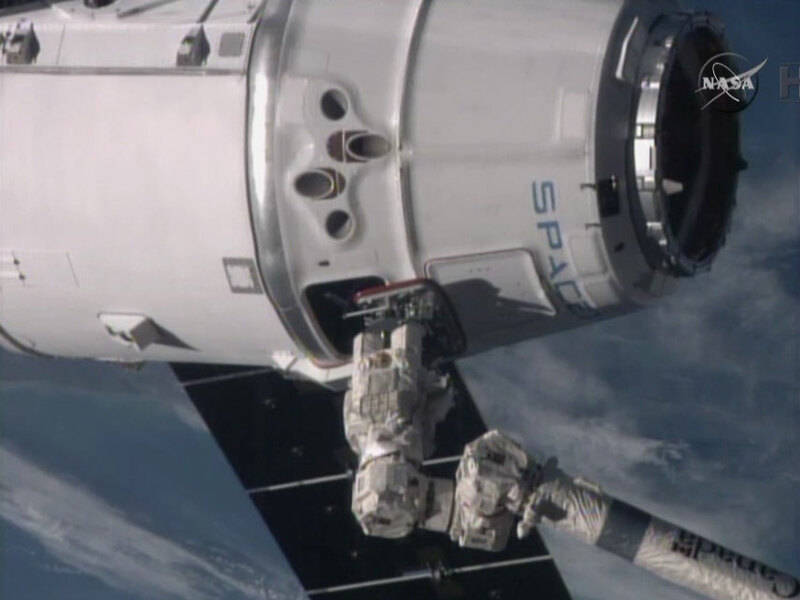 The six-member Expedition 42 crew worked Dragon cargo transfers and science on the International Space Station Wednesday. Commander Barry Wilmore conducted botany research and harvested plants grown for the Advanced Plant Experiments-03-1 (APEX-03-1). The thale cress plants are photographed and preserved in a science freezer for analysis on the ground. NASA astronaut Terry Virts processed samples for the Coarsening in Solid Liquid Mixtures-2 (CSLM-2) experiment, which studies the processes that occur in materials for consumer and industrial products. He later unpacked more gear from inside Dragon. Ground controllers are preparing the Canadarm2 and Dextre to remove the Cloud-Aerosol Transport System (CATS) experiment from Dragon’s exposed trunk and install it on a platform on the outside of Japan’s Kibo laboratory. CATS will observe aerosols in Earth’s atmosphere to understand the impacts to global climate and create a better model of the climate feedback process. The International Space Station residents were back at work Thursday after an ammonia leak indication sent the crew over to the Russian segment. 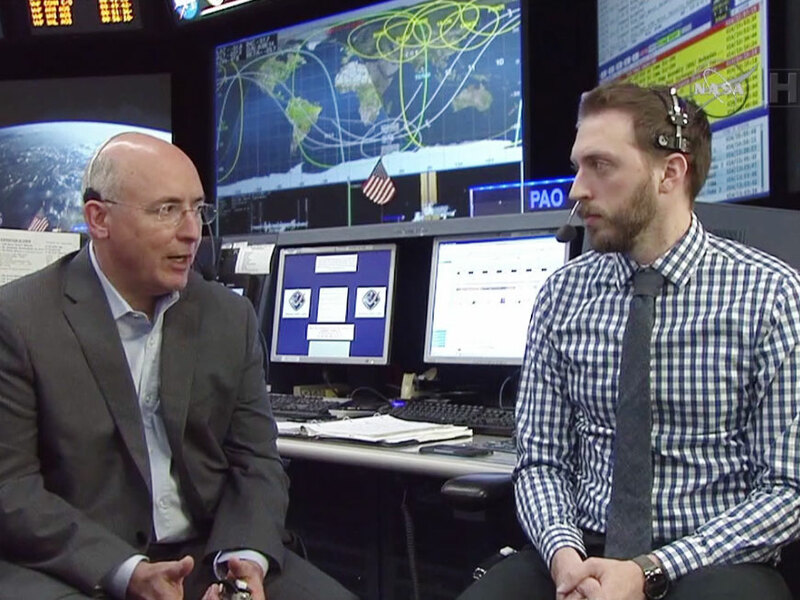 Flight controllers determined there was no leak and NASA managers allowed the crew to resume normal activities and open the U.S. segment back up. This week, the orbital residents kicked off several new experiments delivered Monday morning aboard the SpaceX Dragon commercial cargo craft. 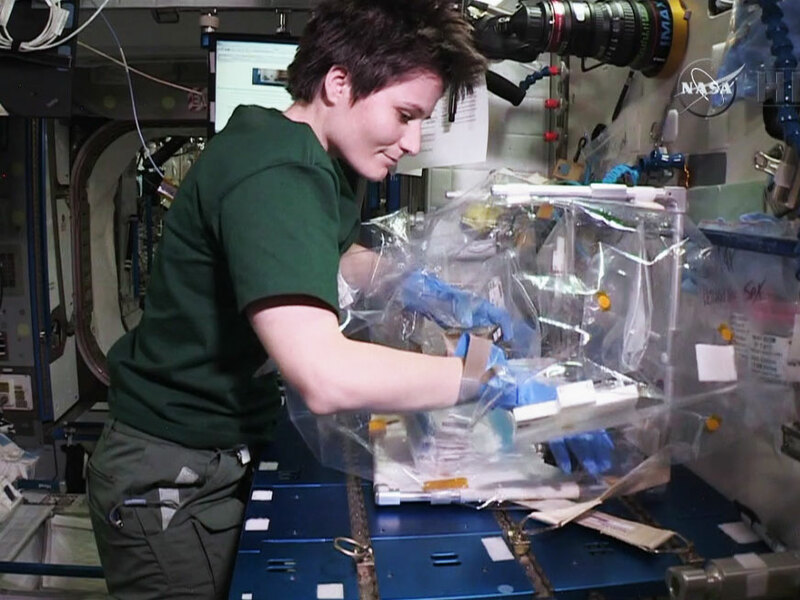 Italian astronaut Samantha Cristoforetti worked in Japan’s Kibo lab module feeding fruit flies for an experiment that will observe how long-term microgravity affects the immune system. 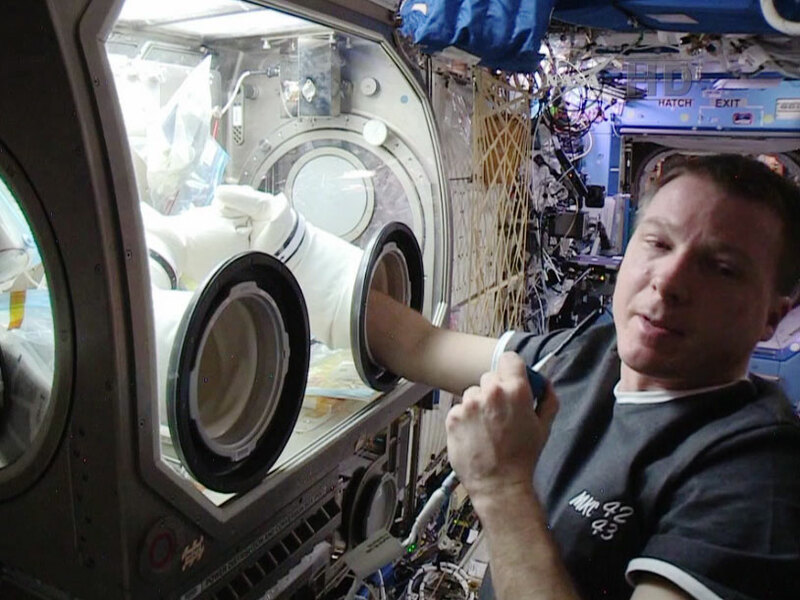 NASA astronaut Terry Virts set up bacteria kits inside the Destiny lab’s Microgravity Science Glovebox for an experiment that explores the risk of infectious disease in space. The International Space Station mission management team, including all of the station Partners, met this afternoon and directed the station’s residents to return to the U.S. segment of the complex before the end of the day, systems permitting. 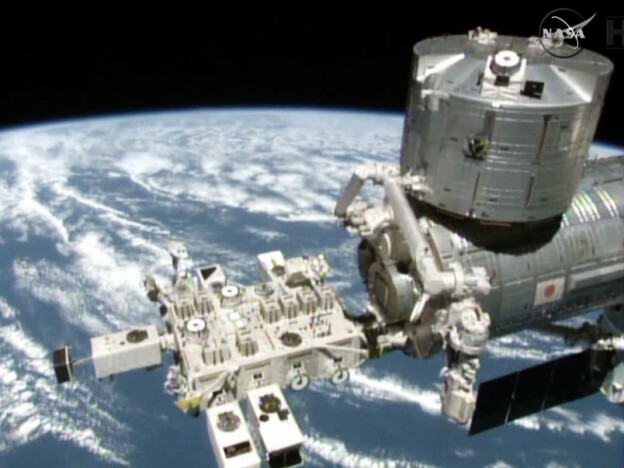 The decision was made hours after the crew members were isolated in the Russian segment following an alarm that could have been indicative of an ammonia leak. The crew is in good condition, was never in any danger and no ammonia leak has been detected on the orbital laboratory. They were informed of the forward plan during their afternoon daily planning conference with flight controllers in Houston, Moscow and the other Partner flight control centers. Around 3 a.m. Central time today, Station commander Barry Wilmore and Flight Engineer Terry Virts of NASA and Flight Engineer Samantha Cristoforetti of the European Space Agency were directed to don protective masks and move into the Russian segment, closing hatches behind them to the U.S. segment due to the annunciation of an alarm that is part of the environmental systems software on the station designed to monitor the cabin’s atmosphere. At the same time, the station’s protection software shut down one of two redundant cooling loops (Thermal Control System Loop B). Data received from a variety of system sources on board have been studied by flight controllers throughout the day and indicate no leakage of ammonia on the station. The alarms this morning that initiated the movement of the crew out of the U.S. segment are suspected to have been caused by a transient error message in one of the station’s computer relay systems, called a multiplexer-demultiplexer. A subsequent action to turn that relay box off and back on cleared the error message and the relay box is reported by flight controllers to be in good operating condition. As a result, the crew will re-enter the station’s U.S. segment today wearing the same protective masks they donned earlier today and will conduct measurements of the atmosphere to make sure there are no traces of ammonia present. Assuming there is no indication of ammonia, the crew will doff their masks and will remain in the U.S. segment for nominal operations. Meanwhile, flight controllers are continuing to analyze data in an effort to determine what triggered the alarm that set today’s actions in motion. Work to reactivate cooling loop B on the station will continue throughout the night and into the day Thursday. The crew members are expected to resume a normal complement of research activities on Thursday as well. 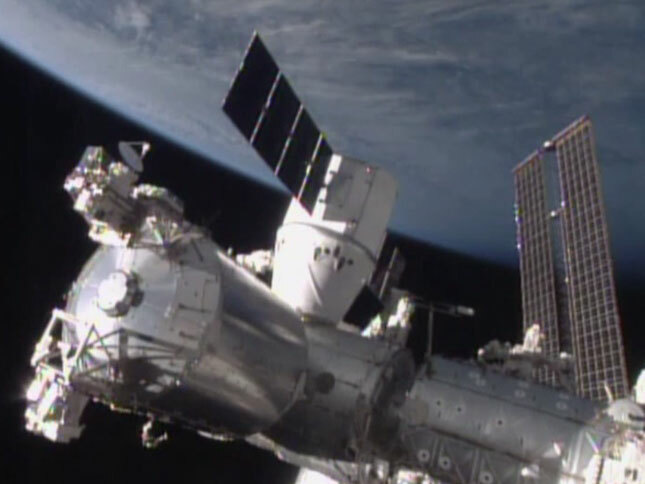 The hatches to Dragon were opened for business Tuesday morning at 3:23 a.m. EST and the crew began unpacking critical gear that will support 256 science experiments. The SpaceX commercial cargo craft was attached Monday to the Harmony module at 8:54 a.m.
One experiment that was immediately set up by Flight Engineer Terry Virts was the Micro-5 study. That experiment observes microorganisms as a model for humans so scientists can understand changes in a crew member’s immune system and the risk of infectious disease in space.